With 2013 Topps WWE Signature Series Dog Tags, collectors can chase a set and make a fashion statement at the same time. As the name suggests, this release highlights autographs with randomly inserted signed dog tags. 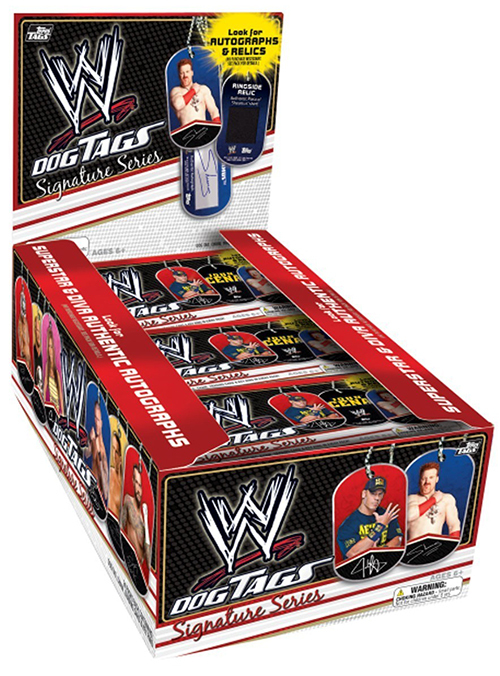 Each pack of 2013 Topps WWE Signature Series Dog Tags includes one dog tag and a matching trading card. The main set checklist includes 30 cards. Twenty-four are current superstars while six are WWE Legends. The dog tags have a picture of the featured star on the front. The chain that comes in every pack makes them wearable. 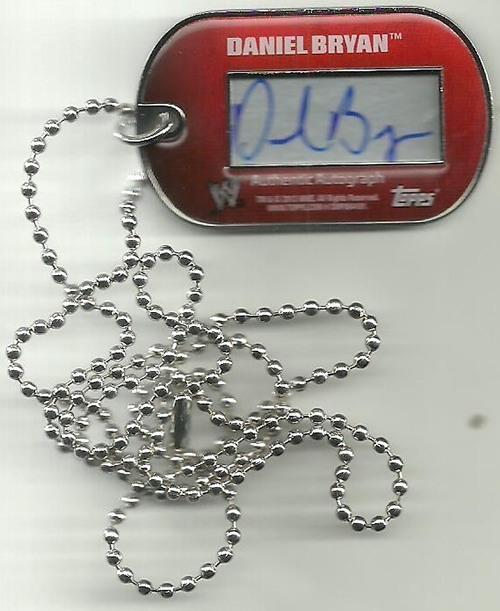 2013 Topps WWE Signature Series Dog Tags have ten total signers: five Superstars and five Divas. Daniel Bryan, Kane and Brodus Clay are among them. Without any Divas in the main set, the matching cards that come with the signed dog tags are extremely rare. Besides autographs, the release also includes dog tags embedded with shirt relics. CM Punk and Sheamus are among the 18 personalities with memorabilia tags. 30 dog tags. Inserted one per pack except those with an autograph or relic. 35 cards. Inserted one per pack. Cards match dog tag found in same pack. Divas cards are only available with autographs.